If you need an Aluminium Tower Hire, you need a service that’s both affordable and of high quality. We understand that when you’re working on a building site you’re probably going to have to do at least some work at height and when you do, it needs to be safe. 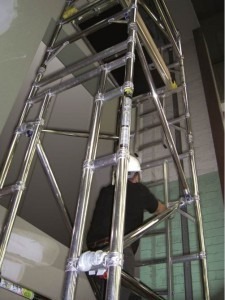 Our towers are all maintained to the quality set by the Health and Safety Executive. Our yard team works a regular and rigorous cleaning and maintenance programme to ensure that our scaffold towers are kept in top condition. Only once equipment has passed thorough inspection will we hire it to you so that we can ensure the safety of you and your team. We understand that you need your first tower hire to be the right one because both time and money are Important. As such, our staff have all been given extensive PASMA training and are all experienced members of the construction industry. Regardless of your situation, they’ll be able to advise you as to the best type of equipment for the task you’re undertaking. Our dedicated delivery team is just as hard working. We deliver on many occasions the same day. If we can’t manage this, we guarantee a pre midday delivery the next day. Don’t worry if you’re working on a build in the middle of nowhere, either, our team can deliver to you wherever you are in the country. Our Alloy towers are lightweight and easy to assemble; once the gear arrives on site you can quickly get to work. Not only this, but if at any time you need to move the tower scaffold so that you can use some other equipment you can simply unlock the wheels and move them to the side. When you’re ready, put the towers back into position, lock the wheels and you’ll be good to go. 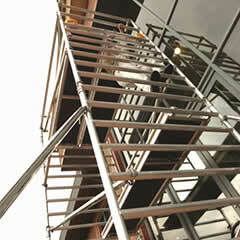 When it comes to versatile access equipment, alloy towers are up there with the best. 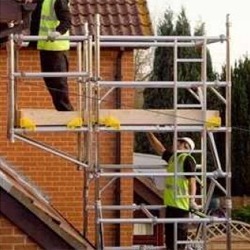 Don’t worry if you’re just someone doing some DIY work on your property, either, we hire our scaffold towers to the public and you don’t need any special qualifications to put up a tower. You don’t need to be a multinational company for our services, and we’ll help you keep to your budget.